On June the 25th 2014, it will be the seventh continual year there has been a symposium (picnic) at George Orwell’s grave. It’s also of course his birthday. 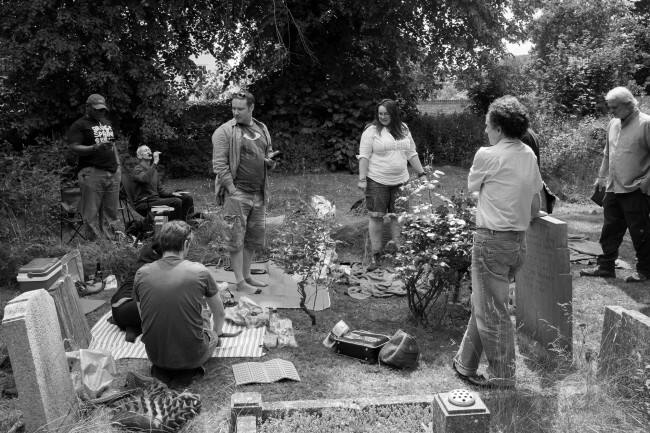 Back in 2007 we sat on the grass sharing food and drink, experiences and stories. As we have done every year since. Asking questions, discussing threatened freedoms and eroded civil liberties… all things Orwellian. It’s always been a small but international gathering. And for most of the last 7 years we have been accompanied by Dr John Perivolaris. Not this year through. So he sent these words.. So.. all are welcome. Details of how to get to our Oxfordshire picnic are below. Bring some food & drink, something to sit on, your thoughts regarding the statement above, news and information, tools tips and tricks. And as ever… an open mind. We live in fascinating times. Public confidence is once again shattered as our government exploits ‘loopholes’ in legislation at the same time as exploiting our lethargy. No one appears to believe their arguments in justifying the mass monitoring of all of us and every facet of our now transparent lives. There are morel, social and ethical considerations to be made if we are hobble this totalitarian tiptoe. Time: 11am – till whenever. Bring: Food, drink, thoughts and something to sit on. Here is a selection of audio recorded at Orwell’s graveside over the years. Here is a link to last year’s intro blog that had some handy links.. I will of course return to the same spot as last year. As a Pioneer/Trancender, I’m always open to new thoughts, new ways of being and am somewhat optimistic about the future. I do wonder whether Simon Critchley’s appraisal says more about his value’s framework than anything else. All of us filter communication in a way that makes sense to us. Our beliefs and our emotions are the mechanisms which affect our understanding and meaning. The rational, thinking beast doesn’t really exist, it’s all smoke and mirrors. Thanks for coming over today. Great day.